Christmas Nap [D6866] - $10.00 : Yarn Tree, Your wholesale source for cross stitch supplies. Cross stitch pattern by Twin Peak Primitives. 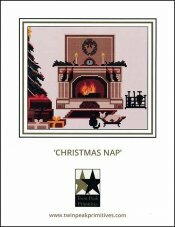 Nothing is better than cozying up to the warm fire on Christmas afternoon for a "Christmas Nap." The warm fire is going with stockings hanging by the mantel & a large Christmas wreath adorned on the chimney. Christmas presents nestled underneath the beautifully decorated tree. Kitty cat & puppy dog take a nap before all of the guests arrive. Stitch count is 133W x 110H.